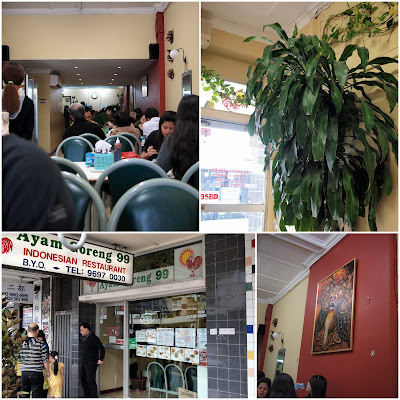 We are lucky to get a table for Sunday lunch at Ayam Goreng 99, the legendary Indonesian hole-in-the wall restaurant on Anzac Parade in Kingsford. We haven't been to Ayam Goreng 99 for a few years, it's great to be back. Today it's packed with the Indonesian Sunday lunch crowd and we are very happy to score the last table in the joint. I first heard of Ayam Goreng 99 ten years ago from an Indonesian bloke whose internet gaming nerd name was 'Ayam Goreng 99' - yes he was a fan. Ordering is unique and efficient - write down your choices with provided pen and notepad and flag down a waiter. We order a couple of dishes and some sides, three dishes arrive on one plate, why not save on washing up eh? Paha Goreng - Deep Fried Marinated Chicken Thigh $6. The restaurant name 'Ayam Goreng' means 'fried chicken', so it is imperative you try this famous fried bird. The chook has a subtle turmeric\curry taste throughout the flesh and does not rely on salt or batter for flavour. Love it. Pepes Jamur - Mushrooms blended with Onions, Chilis and Spices Roasted in Banana Leaves - $4.50. This was our favourite part of the meal. We'll be back to try the tofu and anchovy versions. Tempe (cakes of fermented soybeans) Marinated and Deep Fried - $2. We love tempe when it is cooked well, this is spot on. Sate Ayam & Lontong - Chicken & Rice Cakes - $9.50. Lovely smokey slithers of charcoal grilled chicken with peanut sauce and a thick sweet kecap manis soy sauce. The rice cakes give the dish the bit of stodge factor and it is delicious with the peanut and sweet soy sauces. Bakmi Ayam - Boiled Egg Noodles with Chicken and Vegetable on Top, Soup on the Side - $8. Another of our favourite Indonesian dishes. The noodles have gorgeous chicken flavour and the chicken pieces and mushrooms on top make this dish near perfect. Es Campur - Mixed Jelly and Fruits with Shaved Ice, Condensed Milk and Syrups $5. Es Campur (also known as ais kacang and ABC) is either wonderful or very dissapointing depending on who makes it. Even in Asia I have plenty of crap Es Campurs. But this one is a beauty: the shaved ice has a wonderful texture and taste, I could taste flavoured sugar syrup with a hint of condensed milk in the one mouthful. It reminded me of the old 'Redskin Split' icecreams we had as kiddies, raspberry ice on the outside and icecream in the middle. Yum. Lots of fruity goodies at the bottom including fresh avocado. A good es campur works as a digestive, similar to sorbet, we leave very happy. 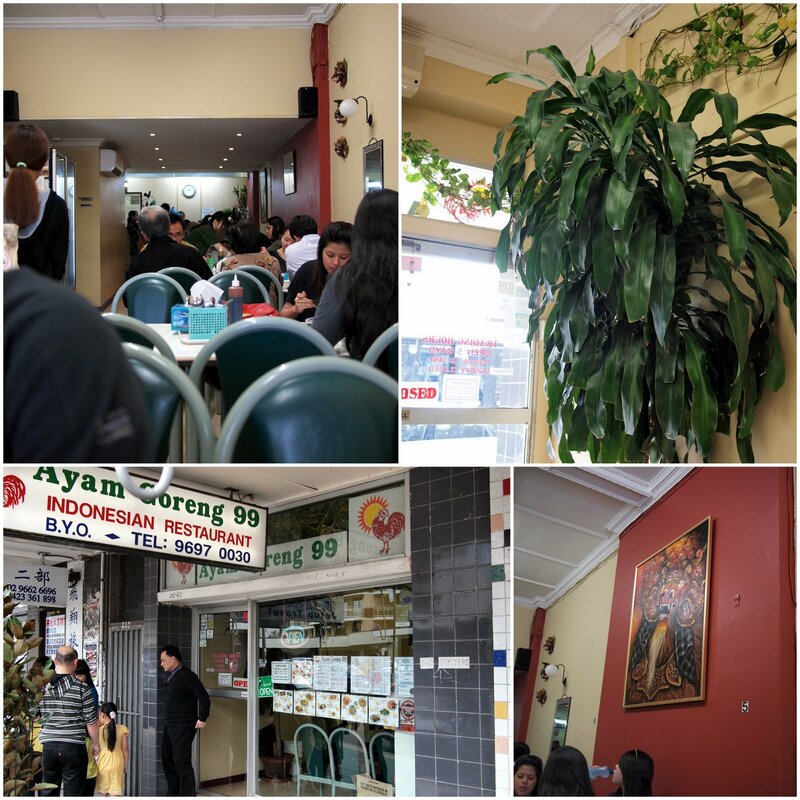 Ayam Goreng is at 464 Anzac Parade Kingsford. Lunch 11am-4.30pm. Dinner 6pm-9pm. Closed Tuesdays. Ph 9697 0030. Oh, the peanut sauce! Drool! I agree that their Grilled Chicken is the best, it has this char/grilled aroma which is better than their fried chicken in my opinion. Their Sambal Terasi (similar to Sambal Balacan, but much spicier) is a winner! This place is AMAZING. I love the mini serves of rendang, the ayam baker (baked chicken) and the sambal kang kong (green veg) Deeeericous!